‘SCOTTEE’ THE SCOTTIE DOG REVEALED AS OFFICIAL MASCOT FOR GLASGOW 2019. Scottee the Scottie dog has been unveiled as the new face of the European Athletics Indoor Championships Glasgow 2019. Scottee will play a huge part in welcoming some of the world’s leading athletes to Glasgow as they descend on the Emirates Arena between 1-3 March as the Championships return to the iconic city for the first time since 1990. 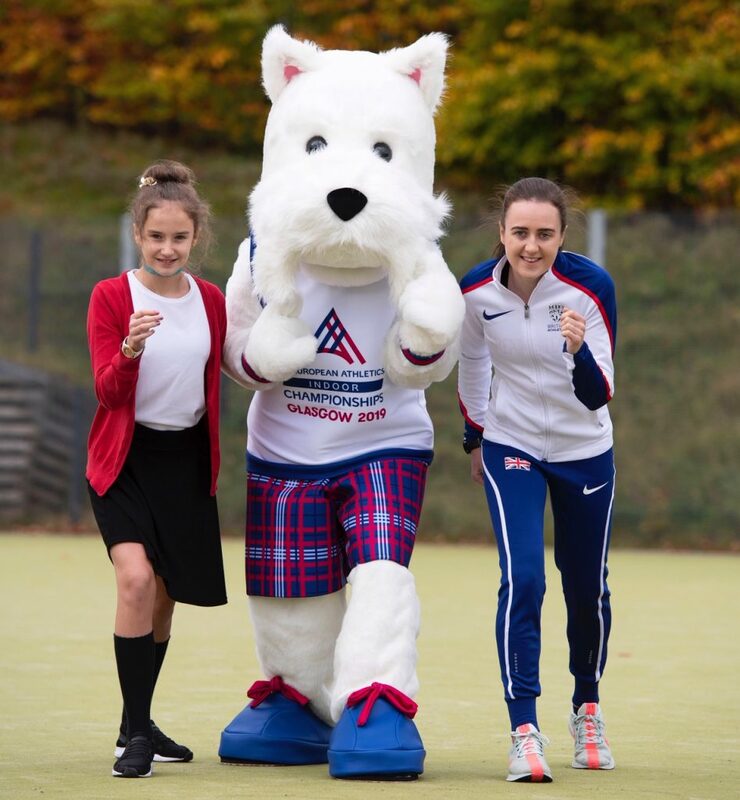 Scottish athletics star Laura Muir helps launch the new European Athletics Indoor Championships Glasgow 2019 mascot – Scottee the Scottie dog. Around 200 enthusiastic children gave the biggest ‘Aww’ as they welcomed Scottee to Crookston Castle Primary School today. The excited Scottie dog made a dramatic entrance but was kept in check by well-known Scottish vet and Championship Ambassador, Laura Muir. As Scottee burst in, Crookston Castle Primary School pupil, Rachael Joss couldn’t believe her eyes as she noticed her mascot design had been brought to life. Rachael won a competition for local schools in Glasgow to design the Glasgow 2019 Mascot and with over 700 entries, she came out on top spot. Paul Bush OBE, VisitScotland’s Director of Events, said: “Events plays a key role in Scotland’s visitor economy and the European Athletics Indoor Championships 2019 will kick off a stellar year of major international sporting events for the country. The city of Glasgow welcomes the return of the Championship as it continues to build its reputation as a truly world class sporting city. The competition will be the second major European event held in Glasgow within twelve months after a hugely successful inaugural European Championships. Glasgow continues to receive global recognition for this reputation with a coveted top five ranking as a sporting destination. The European Athletics Indoor championship Glasgow 2019 is guaranteed to give the crowd at the Emirates Arena unmissable entertainment. The full competition schedule is now live on www.glasgow2019athletics.comwith tickets available across all events.